18 years after Phantasm 4, Don Coscarelli brought the phans the ultimate finale to the long running Phantasm series: Phantasm 5: Ravager. Funnily enough, Phantasm 5 is the only Phantasm movie not to be directed by Don Coscarelli; he only co-wrote and produced Phantasm 5 whereas David Hartman directed and co-wrote this film. David Hartman is best known for as the Supervising Director on the animated TV shows Transformers Prime and Tranformers: Robots In Disguise, so Don Coscarelli’s choice to collaborate with David Hartman on Phantasm 5 is…bewildering to say the least. Phantasm 5 was filmed in secret with production starting as far back as 2008, and it was envisioned as a spinoff series that followed the adventures of Reggie as he travelled through The Tall Man’s many dimensions trying to locate Mike. However, the idea changed from being a spinoff to becoming a whole new feature length canonized movie to close the Phantasm series once and for all. Phantasm 5 continues the trend of the previous Phantasm sequels by being so strange in comparison to the previous movies. Thus, taking the previously established canon of Phantasm into brand new territories. Whereas the previous movies had Mike as the main protagonist throughout the entire series, Reggie is now the main protagonist of Phantasm 5 as he searches for Mike after the events of Phantasm 4. However, Phantasm 5 decides to do away with a linear, coherent narrative and instead decides to jump back and forth between cinematic ‘realities’ leaving the viewer so confused about what is really going on. The film jumps between a ‘Road Trip’ action scenario – where Reggie travels along the road in his muscle car fighting Silver Spheres and trying to find Mike – a Post-Apocalyptic war scenario – where The Tall Man has taken over the world with his Silver Spheres and Hooded Dwarfs, to which there’s a small group of resistance fighters that are fighting back against him led by Mike – and a more sombre scenario where Reggie is in a care-home being visited by Mike, and all of the events of the film are happening inside of his head because of his dementia. Firstly, the scenes where Reggie is in a ‘Road Trip’ action style movie is dropped not long after it’s introduced Aside from a few touching easter eggs, such as the song Reggie plays being the same song that he and Jody played in the original Phantasm, these scenes don’t really add to the plot. Although a viewer gets so see Reggie driving fast and shooting enemies like he’s the star of his very own Phantasm based Grand Theft Auto game, this first act comes, goes, and is quickly forgotten in favour of strange scenes between Reggie and The Tall Man. This section does revisit some of the horror elements that are supposed to characterise this supposed ‘horror’ franchise, and these moments definitely stand out. The Post-Apocalyptic scenario is far, far too distracting for a Phantasm film. Although I am fully aware that the previous films have action and Post-Apocalyptic elements to them, to see Phantasm 5 drop all pretence and become a full-on apocalyptic war scenario is just too ridiculous. At this point, the movie begins switching between Reggie in a care home and the Post-Apocalyptic scenario, so, as a viewer, I became so confused as to what was really going on. In all honesty, I wanted the post-apocalyptic scenario to be a damned lie, because it is so out of place and jarring that I didn’t find myself enjoying these sequences. They were just distracting, and completely bewildering. Part of me believes that this is still part of Don Coscarelli’s ‘Phantasm’s End’ fantasy that never came to fruition, but this scenario doesn’t work at all in relation to the canon of the previous Phantasm movies. However, the scenes of Reggie and Mike in the care home are actually dramatically gripping and genuinely touching to experience. In these scenes, the tone shifts to a more sombre, reflective atmosphere instead of one of action, or horror. In these scenes, I actually felt the sympathetic relationship between Reggie and Mike that had built up over the course of five movies. To see them interact, not with action or ‘bro’ sentimentality, but to genuinely see these two characters sit and talk about an upsetting situation is quite gripping. I believe it’s because the relationship between these characters have built up for five movies, or 27 years, and to see them just talk person to person about their situation is genuinely emotional to watch because the audience has followed these characters on their journey. To see them talk together is almost like watching them say goodbye, that is before the film’s final, soul-crushing revelation genuinely does say goodbye to the series…or at least it would have if David Hartman hadn’t put in a mid-credits sequence which ruins the intended effect of the ending. That mid-credits sequence, ruins the credibility of the film’s best moments, and it left me feeling bitter after what was supposed to be the ultimate ending. I know this wasn’t the intended effect, because the mid-credits sequence was supposed to be a few cut scenes added in mainly because it re-introduced a nostalgic character. However, the fact remains that anything put into a credits sequence is still part of the film-watching experience. Take the Marvel movies for example, the end-credits sequences aren’t just bonus, non-canonical easter eggs, they’re part of the viewing experience. By putting in this mid-credit sequence, the emotional impact that the final scene had on me was completely nullified. I was left bewildered, confused, and quite angry. That cut scene shouldn’t have been there, it should’ve have been left with the extras on the DVD release. Nonetheless, Phantasm 5 once again reunites the same cast with Reggie Bannister, Bill Thornbury, A. Michael Baldwin and Angus Scrimm playing the Phantasm series’ usual suspects. However, in this final entry they brought back Kathy Lester and Gloria Lynn Henry as well; replaying their roles as The Lady In Lavender and Rocky respectively. The acting is still quite decent with Reggie Bannister, Angus Scrimm and A. Michael Baldwin giving very strong performances. Although, it has to be said that a few of the film’s first time co-stars such as Dawn Cody, Daniel Roebuck and Stephen Jutras give less than stellar performances alongside the returning actors. However, Bill Thornbury isn’t in the movie for long and thus he doesn’t diminish the movie like he’s done in the previous Phantasm movies, so that’s a plus. All in all, there’s not much I can say about the quality of the acting because it wasn’t one of the film’s major focuses. However, one of the film’s major focuses is the special effects and camera-work. Phantasm 5 is a very cheap movie that seriously looked like it was recorded on a simple camcorder. Whilst watching it I was reminded of films such as Alien Blood and Evil Aliens: films that were made on a shoestring budget and recorded on cheap cameras by first or second time filmmakers. It’s not the usual approach taken by a filmmaking legend like Don Coscarelli. Although David Hartman’s team tries to add a lot of visual style through the film’s very colourful lighting and creative shadow-work, there’s no hiding the fact that Phantasm 5 looks like the roughest, cheapest movie out of all the Phantasm films. That’s not to say good films can’t be made on camcorders, but this style is far from what I was expecting from Don Coscarelli 40 years into his filmmaking career. The special effects, however, are all CGI. The blood, the action, the spheres, the gunshots, even some of the locations, they are all made in post-production using computer generated imagery, and it all looks cheap and nasty. In 2016 CGI had reached a decent place in the film industry, but since Phantasm 5 obviously did not have the budget to be able to afford effective CGI software, the CGI effects look laughably weak. The spheres have no texture or lighting, blood is texture-less, gunshots are obviously edited in Bad Taste style, and the CGI sets lack texture, detail, or effective lighting. Now, this wouldn’t be too much of a problem usually, but Phantasm 5 is so CGI heavy. Not only is it so jarring to experience when stood alongside the physical effects of the previous movies, but the fact that the CGI is so lame and unconvincing makes Phantasm 5 feel ridiculously amateurish. Phantasm 5 was nowhere near the sombre farewell or the last big blowout that it needed to be. I feel like Don Coscarelli wanted Phantasm 5 to be both a last big bang and a sombre farewell, but in trying to be both, Phantasm 5 becomes neither. I was very underwhelmed by this movie. The only reason I would recommend this movie is because of the scenes where Reggie is in a rest-home trying to determine fantasy from reality. Those scenes are sympathetic, touching, and they work so well on an emotional scale, but the fact that Phantasm 5 mixes everything else up right until the last second is what really drags the movie down. Upon reflection, Phantasm should never have had sequels. 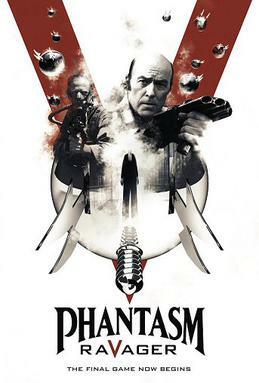 I get that it was Don Coscarelli’s pet project, and it had its cult fanbase, but to see what the Phantasm series became I can’t help but feel disappointed. The sequels definitely missed what made the original movie so powerful, and the movies slowly went downhill from Phantasm 2 onwards. It’s a shame because the first movie had so much potential, but it really did not need or desire a sequel. It’s not one of the greatest horror movies of the seventies, but it had so many original ideas and frightening elements that were squandered with each and every sequel that was produced. It’s sad to see a film series fall so far and miss the original point so hard. However, after all is said and done, this entire series does have its one good element: the ongoing character development and relationship between Reggie and Mike. Their relationship becomes so close and human that by the end of the series that their interactions in Phantasm 5 become legitimately emotional to witness. That alone makes the whole of the Phantasm series worth watching. That’s the one thing I’ve taken away from the Phantasm sequels.